Understanding how licenses and projects relate is a key concept behind using the concrete5.org Marketplace. Once you're familiar with how the system works, you'll find it to be an easy way to manage stuff you've purchased. When you buy an add-on or theme from the concrete5.org Marketplace, you're purchasing a license to use it on one website. To see a list of all the licenses you own, visit your profile's licenses page. Each website you connect to the concrete5.org community is represented as a "project" in your user profile. You can see a list of all your projects by visiting your profile's project list page. 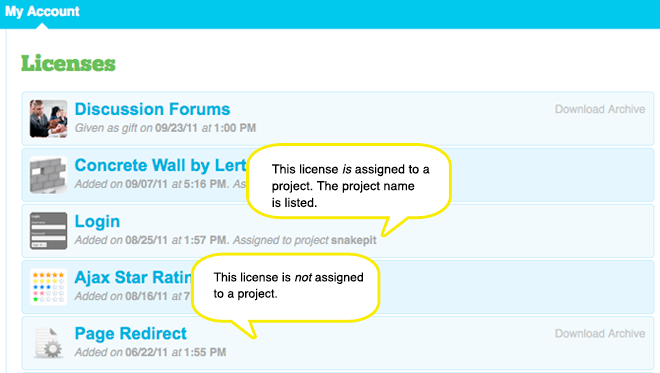 Go to your profile's project list page and click the name of your project. This will take you to the project page we want to work with. On the project page, scroll down until you see the list of add-on and theme licenses currently assigned to this project. At the bottom of the list, find the grey bar titled "Add item to this project" and a dropdown menu titled "Select a license." This menu lists every available license. 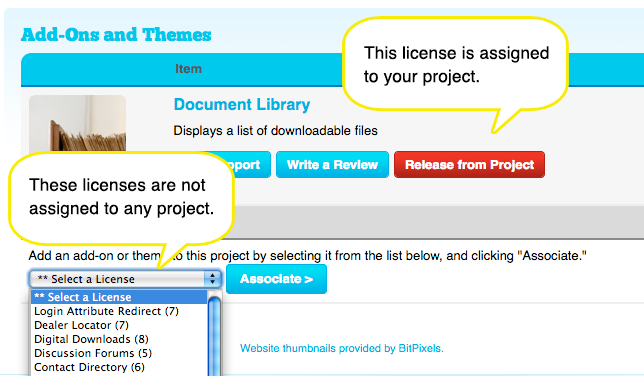 An available license is one that is not assigned to any project. To assign a license to your site, choose the add-on you want to use on your site from the dropdown menu and click the Associate button. That's it! The license is now assigned to your project. To complete the installation process, log in to your site's dashboard and go to the Add Functionality tab. The add-on or theme should now be available for download. What if I don't see my license on the list? Is the license already assigned to a project? On your profile's licenses page you may have noticed that below every license is the name of the project it's assigned to. If it's not assigned to a project, no project will be listed and a "Download Archive" link will be present. This is a great way to figure out which project is using a particular add-on. If you need to transfer a license from one project to the other, please check out this how-to: Transfer a License.